Downtown Vancouver 1068 Hornby St. The Canadian - functional 5th floor studio in heart of city living. Close to theatres, restaurants, bars, and Robson Street. 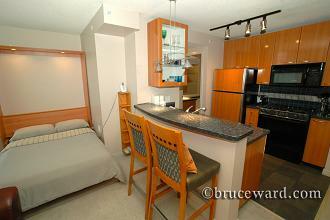 *DOUBLE* (Murphy-style)wall bed, gas fireplace, dishwasher, DVD and in-suite laundry, internet and secured parking. (Minimum 1 month stay)Paid fitness available through Sheraton Wall Centre Hotel.